Back-Up Story: "History of the DCU, Part 3"
Renee Montoya is working for the Question doing surveillance for the past two weeks. She is bored but sober. Meanwhile, a group of astronauts including former Outsider Halo is scouring the universe looking for the heroes missing in space since the Crisis ended. Halo senses a zeta beam. The astronauts decide to contact President Horne. [No caption indicating Day 2 but it was night in Gotham on Day 1 and the next scene in Metropolis it's morning - and there's no caption for Day 2, so unless Day 2 is cosmically misplaced as the result of the next big crisis, I'm assuming it should read "Day 2" right here]. In Metropolis, super-heroine Fire tries to persuade Booster Gold to join the rescue team. Booster wants to stay on Earth and help himself. Fire leaves angrily and leaving a smoldering green fire where Booster's front door used to be. Montoya is on surveillance again and is surprised by the Question. She tells him that she'll do this for four more days and then she's done - done working for the Question and presumably done being sober. Meanwhile in Metropolis at the Steelworks, John Henry Irons works on the Steel suit. As he does, he talks to two figments of his imagination: himself in a suit and tie setting the example for his niece by not being Steel, and the Steel armor itself. Irons vomits and realizes he's been drugged. He reaches up and grabs onto a computer for support to stand - the metal morphs and melts into or onto Irons himself and there's a huge flash of light. Ralph Dibny has found Cassie Sandsmark (Wonder Girl) and her fellow Kryptonian cultists including someone named Devem (another Dev-Em is one of the only people to ever refuse Legion membership in the 30th Century). Cassie and the cult deny leaving the resurrection symbol on Sue's gravestone. According to Cassie, "The Kryptonians believed that immersion in the striped waters of the River Memon granted visions of the afterlife." She offers Ralph the opportunity to be immersed. Devem tells him he must give them something significant in exchange. Ralph says that he's already lost the only significant thing in his life - Sue. He is held underwater and appears to black out momentarily. Coming out of the water, the cultists are gone and so is Ralph's wedding ring. A hulking behemoth walks into the house that Montoya's watching as Montoya sleeps. She's startled awake and goes into the house where she's joined by the Question. Montoya flicks what she thinks is a light switch and a secret floor opens underneath Question and Renee. They come face to face with a green scaly monster dressed in clothes that appears to be taking a box. He tosses the box at Montoya and it cracks open against the wall - it's loaded with some kind of weaponry. As the Question is about to be killed by the monster, Renee fires some kind of high-tech laser gun that appears to incapacitate and/or kill the monster. Nothing happens in the DCU at all. Right. Operation Lightning Strike is a joint military - hero alliance and they've arrived in Western Australia where Halo has apparently been able to influence the Zeta Beam current to the ground. Some of the heroes are back but they are hardly safe and sound: Hawkgirl appears to be giant-sized and missing a hand; Golden Age Green Lantern Alan Scott appears to be missing an eye (if you're reading "Checkmate", though, you already know that - and now know why); former Titan Herald appears to be stabbed, bloody, and possibly dead; former Titan Bumblebee is now tiny (not Atom-tiny, think more Doll Man tiny). Finally there are two others that I can't identify who appear to be partially melded together. Main Story - 4: Some might say the story is proceeding too slowly for their taste - and there's no doubt things are moving slowly but that is the clear downside of this daily journal style of comic book storytelling. Tights or no tights, sometimes stuff happens and sometimes it doesn't. And we all know from our own personal lives, things can be copasetic for days, calm and uneventful and then the proverbial fan gets flanked by poo after poo. Some might say the DCU of 52 is too dark. Well the world did just come close to ending - again - and I am enjoying the realism of these first post-Crisis days being filled with the rescue effort and the beginnings of a lot of post-traumatic stress disorder for people like Steel and Booster Gold. For those keeping track at home, by the way, the week's biggest news story is the return of Batwoman and the revelation of her sexual orientation - we got a glimpse of her at the end of Infinite Crisis but she won't be showing up in 52 for a few more weeks yet. Don't fret - it's still a one-lesbian issue with the prominently featured Montoya, a character I really like for her stark brutal and realistic descent and what appears to be the Question's effort for some unknown reason to help her out of her despair. The ridiculously overblown coverage of Batwoman's orientation this week is countered nicely against a character as understatedly portrayed as Renee Montoya. It leaves the message that, no matter what the media thinks, we walk among you because we are you. Art - 4: This is a pretty book that ranges from the darkness of Gotham to the crystalline light and bright waters of the Kryptonian cult headquarters. Backup Story - 3: Donna Troy continues reviewing the DCU's history - this time out, it's the original Crisis on Infinite Earths. Donna recalls the demise of Earth-3, the Monitor and Harbinger recruiting heroes and villains and saving Alexander Luthor and the ultimate sacrifice made by the real first Supergirl, Kara Zor-EL, of Argo City and the sexiest blonde in a headband this side of Olivia Newton-John. Donna Troy recruits a legion of heroes to travel with her into deepest space on her say-so only. Then, when those heroes need her help the most - when, on Earth, as we see in the lead story, a search goes on to recover them, what does she spend her super-duper, and to-date still really undefined powers, doing? Reviewing a past that no longer exists and mourning losses of Kara Zor-El (the one who died in "CoIE" #7) and the like is disrespectful to Kara's memory - one thing about Kara is she believed if you could help, you help (remember that exchange in the first "Crisis on Infinite Earths" #4 where Kara gives Batgirl a pep talk on everyone doing what they can to help against the weird weather and red skies?). It's like mourning World War I when everyone else is cleaning up the mess of World War II. It's just not the time when she should be doing more. Oh one more thing while on the subject of Donna Troy. I get it that one of your past lives was that you were Dark Angel, the Anti-Monitor's answer to Harbinger. 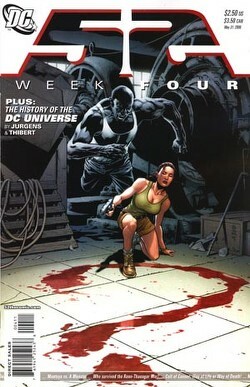 But, DC, you've gone one step short of saying Donna has a relationship to the deceased Harbinger herself. Why? And if she isn't Harbinger reincarnated, then why does she above everyone else get Multiverse-orb access? The back-story earns a "3" rather than a "2" for finally giving long time readers back the memory of Kara, the memory of her sacrifice, and her Kal-El's - and the universe's - loss. Art - 4: Even without reading the dialogue, it is the art that manages to convey the bulk of the first seven issues of the first "Crisis on Infinite Earths" in three pages. Nicely done. Cover Art - 3: This is my least favorite cover of the series so far. The question mark is certainly appropriate because I'm left with questions - primarily, who is that grey colossus sneaking up on Montoya. It's not the green scaly thing that attacked her and the Question in the issue, that's for sure. Steel perhaps covered in metal? I don't know. Covers don't need to be scenes from the story inside, they can evoke themes, but to me this cover didn't do either of those things.